More prominent Republicans - including a congressman - have they said they will not vote for Donald Trump, arguing he is unfit to serve as president. On Tuesday, Richard Hanna of New York became the first Republican congressman to publicly declare that he would vote for Democrat Hillary Clinton. Mr Hanna called Mr Trump "a national embarrassment". Other Republicans have distanced themselves from Mr Trump or withheld their support. Mr Trump's statements and policies about women, undocumented immigrants and Muslims have unsettled many Republican Party leaders. Mr Hanna, who is retiring in November, said he had been considering voting for Mrs Clinton for months, but Mr Trump's recent comments about Khizr and Ghazala Khan had finally persuaded him. 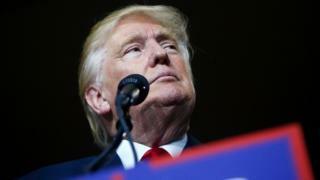 At last week's Democratic National Convention, Mr Khan, the father of a Muslim US soldier killed in Iraq, criticised Mr Trump's plan to temporarily ban Muslims from entering the US. Mr Trump responded by attacking the Gold Star family, the term for families that lost a relative in war. Democratic and Republican leaders as well as veteran groups quickly condemned him. "I hope Americans understand that the remarks do not represent the views of our Republican Party, its officers, or candidates," said Arizona Senator John McCain, a Vietnam War veteran and former prisoner of war. Who was Capt Humayun Khan? On Monday, Sally Bradshaw, a top adviser to former Florida Governor Jeb Bush, said that Mr Trump's candidacy had convinced her to leave the Republican Party. Ms Bradshaw said she would vote for Mrs Clinton if it looked as if Mr Trump could win her home state of Florida. Until recently, many Republicans opposed to Mr Trump stopped short of supporting Mrs Clinton, saying they would vote for a third party and write-in candidate. Mrs Clinton has been actively courting moderate Republicans in recent weeks. Her convention featured several Republican and independent speakers, including former New York City Mayor Mike Bloomberg.